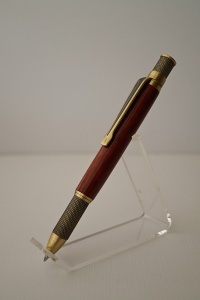 The Knurl GT paired with bloodwood is one of our most popular pens. With its sleek industrial look and clean lines, the Knurl GT is a real head turner. The precision-cut knurled finish diamond pattern on the tip and end cap provides a comfortable feel and writing experience. You will find the pen has an ideal weight and balance to it. The rustic, authentic look of this antique brass will pair beautifully with the bloodwood chose.